An early adopter is described as a person who starts using a product or technology as soon as it becomes available. It’s often times a role I don’t like to find myself in as other early adopters will know, it can be quite frustrating buying a brand new product that just hit the market only to find out that it has kinks and glitches galore. Let’s see, some of the products I’ve “early adopted” in the recent past where I either pre-ordered it or purchased it the first day or week it was released were the Blackberry Torch, Samsung S4, the Blackberry Playbook, and the Pebble Steel. Some of the above products were great and gave me nothing but satisfaction and affirmation that I made the right choice in purchasing it right off the bat. Others **cough I’m looking at you Playbook cough** became painfully obvious that my role as an early adopter meant that my hard earned cash went straight down the drain. I was so excited about the first tablet that Blackberry offered that I was ready to shell out over $600 on its pre-order and the belief that everything that was promised about it worked the day I got it. Nope, after delays upon delays of false promises and pretenses, I quickly realized that I should have at least waited before I jumped in head first. As a matter of fact, I probably should have waited 6 months after the release date to find out that what I bought for $600 was now being sold for $200. Yeah, bad decision there. Fast forward to May 2015 where my food blog is in full swing and my reliance on my smartphone is at an all time high. From keeping up to date with social media to taking food pictures at any opportunity I can find, my current smart phone (Samsung S4) is truly a tool I cannot live without. Enter LG Corporation, a South Korean multinational conglomerate known to millions of people worldwide through their electronic, chemical, and telecom products. You probably even have one or two LG products that you own right now at home. Like any of the major international technology companies out there like Apple, Samsung, HTC, Sony, and Microsoft, LG has also made its mark in one of the most competitive industries out there right now for the battle of smart phone supremacy. LG’s flagship smart phone line up is their G Series. The “G” was first introduced in 2012 as a branch of their old flagship LG Optimus series. The first purely “G-branded” phone, the LG G2 was unveiled in 2013 and two years later, LG is putting forth their most revolutionary smart phone yet, the LG G4. I was beyond thrilled when LG reached out to me (me… seriously? ), and invited me to “test drive” their new flagship phone, the LG G4 before it even got released in North America! I follow many technology websites in my spare time such as Engadget and I have always wanted to be one of those people who had the opportunity to get first dibs on a new product before anyone else. 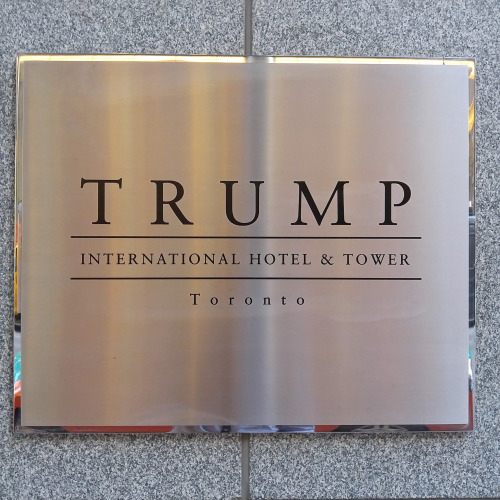 LG was holding an exclusive Toronto briefing at America Restaurant located at the highest floor of Trump International Hotel. 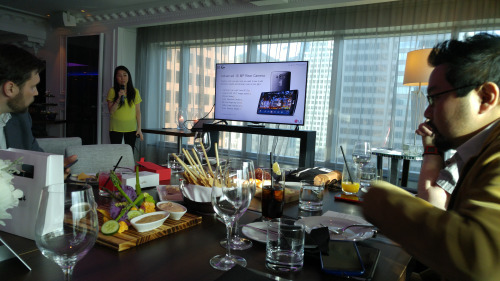 Attendees had a chance to learn about the product directly from LG executives and were given our very own LG G4 to take home and test for a month. When I first arrived I was immediately given my LG G4 and sat down to set everything up. The unboxing and first few moments of turning on a brand new gadget is always my favourite part. One of the LG tech experts came over to set up all of the more complicated aspects of it such as hooking up my phone to the Bell network. I have a working phone number and data to use as well! The phones we all received are unlocked phones flown from Korea since the LG G4 is still not yet released here in Canada, but I was told that the unlocked phone I have will be the exact same once it gets released in just a few short weeks here. Once I got settled I soon realized that I was not at my usual food blogging event as I didn’t see any other food bloggers here. LG picked the select attendees from different industries where the LG G4 can be showcased in various venues and environments. I noticed there was a TV host present, businessmen, a concert goer, professional photographers, and then there’s me, the food blogger. I really felt honoured that LG chose me to represent the food blogging community! We even got ourselves some customized LG cards that were personalized to what we were each known for. For me, my LG cards were all personalized about food and restaurants! 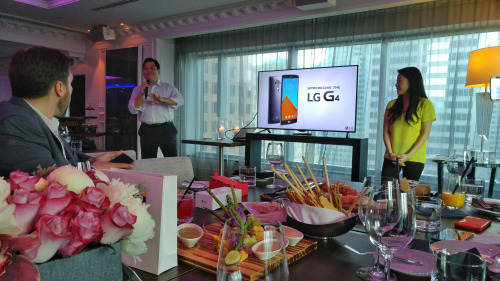 Throughout the night we were served some seriously delicious food from America Restaurant and we then sat through the power point briefing from the LG executives to give us a breakdown of all the new features we would find in our new LG G4 phones. The night ended with some cute little LG G4 cupcakes and chocolates that we were able to eat and take back home with us. I am still in the middle of testing out the LG G4 and have incorporated it with my daily life. It’s actually great to be carrying two smart phones with me all the time (one smart phone runs out of batteries, no worries I have another one!). So far the LG G4 has been nothing but positive and as a food blogger who relies on my camera, the camera on this phone is phenomenal and definitely one of the best out in the market right now.